These Russian cabbage rolls are traditionally cooked using minced meat, but a healthy vegetarian version can be made with rice, mushrooms and vegetables. Cabbage rolls stuffed with various ingredients is a very popular dish in Russia. It is common not only in Russia, but also in the ethnic cuisines of the Balkans, as well in other parts of Europe (such as Finland and Sweden) and the Middle East. The cabbage rolls are called "golubtsi" in Russian, and the word sounds similar to the Russian word for pigeon—"golub." Apparently, in the 17th century, when French cuisine was gaining unprecedented popularity in czarist Russia, it was fashionable to eat pigeons that were prepared on a grill in the open air. Later on, in a similar fashion, the grill was used to prepare cabbage rolls called "fake pigeons”—and that’s where the name comes from. Traditionally, golubtsi are made with rice and minced-meat filling. Nowadays, people prepare a vegetarian version with rice, mushrooms and a vegetable filling. The process of making cabbage rolls is time-consuming and requires certain skills: But the result is worth the effort. 1. Remove the cabbage leaves, cutting them from the stem one by one. It’s better to use a larger cabbage. Try not to damage the leaves. The thick part at the bottom of each leaf should be cut so that it will be possible to roll. These leaves should be blanched: Put them in boiling water for 2-3 minutes, until they become soft but not cooked. Remove from the water and put them aside. 2. Filling preparation: Fry chopped onions and carrots; add mushrooms and seasonings to taste (salt, pepper, masala, herbs). Mix with cooked rice. 3. Put 2-3 tablespoons of the filling on a cabbage leaf and make an envelope. In many recipes, it is recommended to fry each roll on both sides. It doesn’t make a huge difference, so you can skip this step if desired. 4. 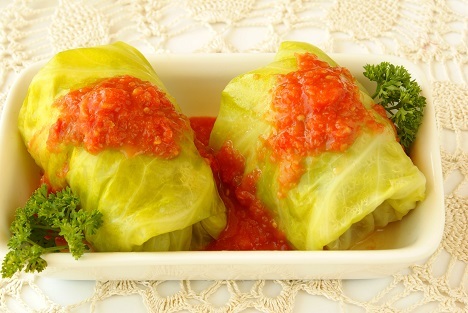 Cabbage rolls should be simmered in sauce until ready. The simplest way to prepare the sauce is to take vegetable stock (maggi cubes will also do), mix with water, curd, spices, and chopped fresh tomatoes or tomato paste. Pour this mixture onto your cabbage rolls and bring to a boil. The amount of sauce should cover 2/3 of the rolls. To serve, cut the rolls into several pieces and generously pour the sauce over the rolls. Sour cream is usually added to serve, but, in this recipe, the amount of curd in the sauce should be enough to achieve the necessary level of sourness. The non-vegetarian (read “original”) version of this dish is prepared with a mixture of rice, minced meat of choice (7 oz. ), onion and spices. You can also add an egg to keep the mixture together. The cooking time will be longer than it is for vegetarian rolls, but simmering for 30 minutes should be sufficient.